Hallo allemaal, ik geef sinds kort bijles in wiskunde, natuurkunde en scheikunde voor Havo en VWO. Als je zoon, dochter of misschien jijzelf bijles in deze vakken kan gebruiken en je komt uit Utrecht ga dan naar www.bijles-in-utrecht.nl. Daar staat meer informatie over de bijles en hoe je deze kunt aanvragen. With the demise of G+ I started thinking about all other Google services that I was using. I also wondered what the risk would be if Google would shut down Blogger, GMail or Google Drive. Instead of hoping for the best I plan for the worst so in following months I will stop using all Google services. Since I'm a free and open source advocate I will replace these services with free and open source services. My first move will be to move my blog from here to WordPress. I already have a WordPress blog but I wasn't using it much but that's about to change. For those that want to follow me there the address is www.homehack.nl. I will continue to blog about open source, 3D printing and 3D CAD and more so hopefully I will see you there. At the end of 2015 I placed a DIY security camera in our house with a view on our backyard. The camera consists of a Raspberry Pi model B and a 5MP camera board module (It's been replaced by a 8MP version). I used Motion, a very flexible program that monitors video signal, on top of Raspbian. It worked all these years without problem but over time the wooden case that I made was starting to fall apart. I therefore decided to create a 3D printed camera case to replace it. I also wanted to use this opportunity to eliminate the problem of glare on sunny days. The camera case consist of five parts. A back and a front of the case, a camera holder and lens to protect the camera module and easily insert it into front of the case, and a lens hood to prevent glare. I used OpenSCAD, a free and open source program to design 3D CAD models. The Constructive Solid Geometry properties of OpenSCAD are excellent for these kind of designs. The back case has mounting points for the Raspberry Pi. 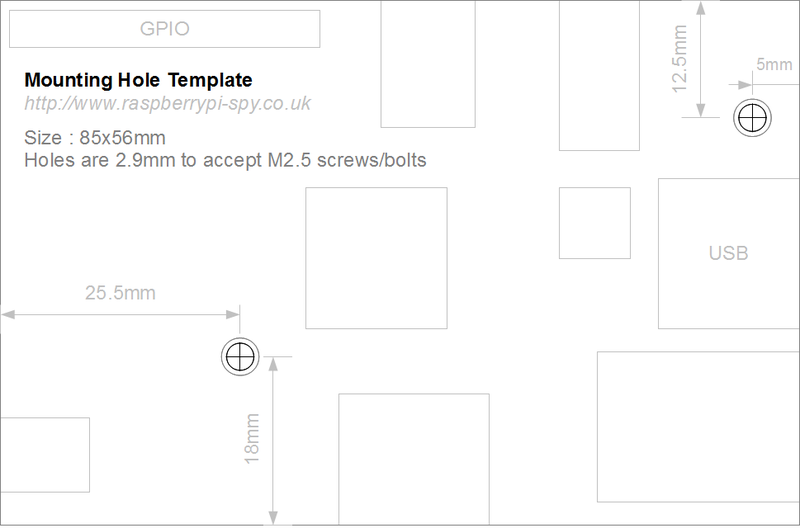 I use the Raspberry Pi B but the mounting points are easily changed for other Raspberry Pi models, in fact I already added the coordinates for some other models. I wrote earlier about the Logitech Media Server (LMS), open source software that I've used to turn a Raspberry Pi into a music server for my Squeezebox devices. I'm using my Raspberry Pi based Logitech Media Server a couple of months and I've grown very fond of it. What started as an experiment now has become a device I'm starting to rely on. I guess that eventually I have to replace it with something like the WD PiDrive Node Zero. In the meantime however I do need to maintain the LMS. In this blogpost I'll explain how I add and remove music files from the LMS and create a simple backup of your music files. Finally I provide a tip to debug problems with the Logitech Media Server. All software that I used for this project is free and open source. My Raspberry Pi turned into an LMS with 3D printed case on my desk. I partly ripped my CD collection and still add new albums. All the ripping is done on my Thinkpad T40 laptop using Asunder, a low resource ripper for Linux, on the Puppy Linux operating system. In the beginning I unmounted the USB hard disk from the LMS, removed it and connected it to the laptop and copied the new albums. This proved to be be a clumsy method and I quickly found myself looking for an alternative. This command sets the ownership of all files on the USB hard disk to pi instead of root enabling me to use FileZilla and gFTP. I invested a lot of time in ripping my CD collection so it would be a shame if I lost my music files due to a hard disk crash. I therefore use a very simple backup method, largely copied from the Raspberrypi.org website to ensure that my files are safe. This creates a file 'usbdrive.tar.gz' that contains files in /media/usb-drive, the mounting point of my USB drive and places it in the same map. Next I use (again) Filezilla to move the backup file to my desktop computer. The sudo ssh command prompts for the password of the Raspberry Pi. Now look for anything suspicious in the log, copy it and do an internet search with your preferred search engine. Chances are someone already encountered the same problem. How can I wrap a flat surface around a cylinder in OpenSCAD. This was a question I asked myself. OpenSCAD doesn’t provide a ready made method so we need to write our own. Luckily we don’t have to invent the wheel here, others have done that already. Justin Lin has written a very handy tutorial on his website Openhome.cc how to wrap a text around a cylinder. In this project I took it a step further and wrapped a png image over part of a cylinder resulting in a curved image. 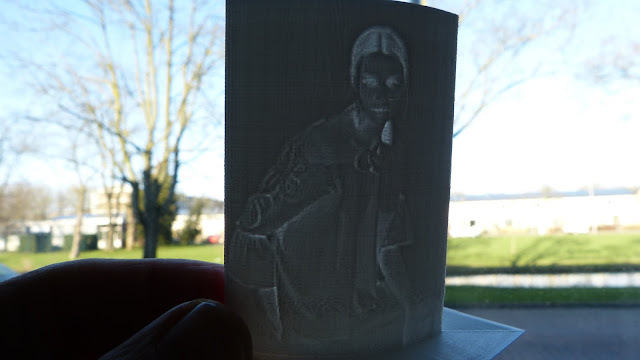 It seemed like fun to combine this technique of wrapping with the 3D print of a lithophane. A lithophane is an engraved image on translucent material. Many 3D printers have already produced lithophanes sometimes with stunning results. For this experiment I’ll use white PLA because it has excellent translucent properties. Now first let me explain the basics on how to wrap a 2D image around a cylinder. First we create a circle out of triangles. These triangles are then extruded to segments to form a cylinder. Next all segments of the cylinder are lined up in a row and the image is place on the far side but just within the limits of the segments. When we intersect the image with every individual segment and return the segments to their original position in the cylinder, a curved image emerges (see images below). The image intersected with the triangles and returned to their original position. If you want to know more please watch my video. In this video the OpenSCAD script is explained and demonstrated. Also is shown how to import the stl file in Cura and what settings are used. 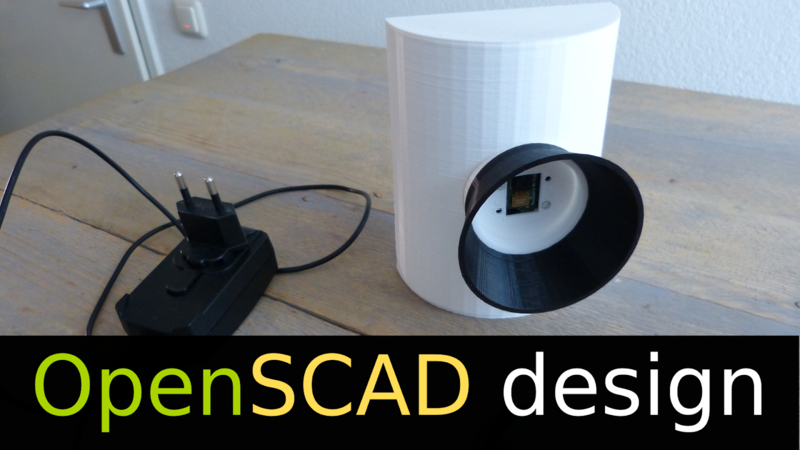 OpenSCAD offers three methods to make 3D model. First is Constructive Solid Geometry where primitive objects are combined using boolean operations. The second method uses two dimensional shapes that are extruded either in the z direction (linear_extrude)) or around the the z-axis (rotate_extrude). In the third method vertices (or points) and faces are defined to shape the surface of a 3D model (polygon mesh). This, at least in theory, provides us with a method to create the most complex 3D shapes. The third method can be achieved with the polyhedron function of OpenSCAD. 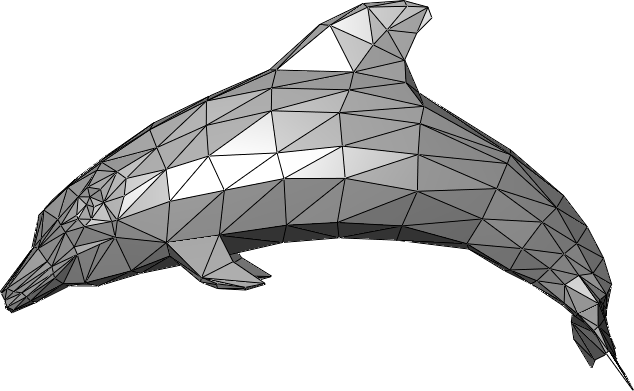 The description polyhedron function in the OpenSCAD manual is more than adequate but it only provides the user with examples where the vertices and faces are manually entered in OpenSCAD. This can be a cumbersome process that is prone to bugs, leading to a non-valid solid. Having OpenSCAD generate these vertices and faces is a method that is more favorable (at least to me) for two reasons. First once the algorithm is correct the chance to generate non-valid solids is minimized but more importantly computer is so much faster in calculating the vertices needed. An important question is what kind of faces are needed for our polygon mesh. From OpenSCAD version 2014.03 onward a face description can have any number of vertex larger than two however I think that the triangle mesh is still the best choice. If the user chooses more than three vertices OpenSCAD subdivides the faces to triangles and this can cause problems as is demonstrated in an article of Justin Lin where a cube that consist of four vertex faces and one of the faces is not planar with the other three. So in conclusion the triangle mesh provides the best control over the 3D model in OpenSCAD. In the following video tutorial I'll explain how to create such a 3D model of a sphere, cone, torus and cylinder in OpenSCAD. Back in August I created a Squeezebox server using a Raspberry Pi 2 and a USB harddrive I had both lying around. I quickly had the server up and running and I'm using it ever since but I didn't have a enclosure. A 3D printed enclosure would enable me to give the server a more permanent place and at the same time I'm getting rid of these components and cables lying around on my desk. 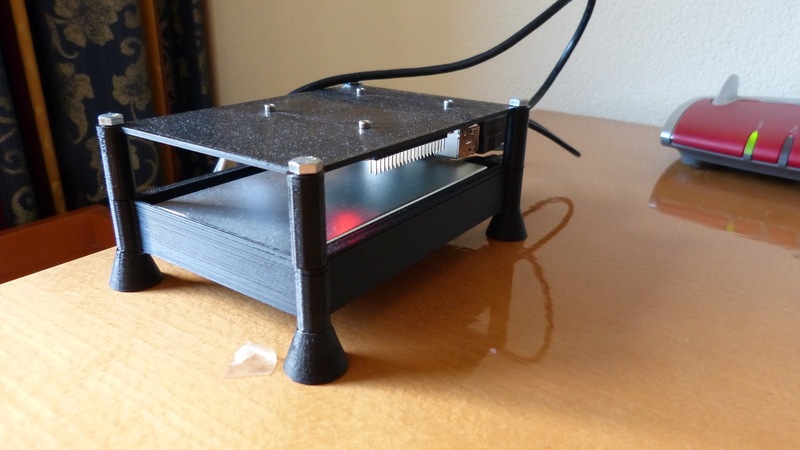 The Squeezebox server sitting nicely into the 3d printed enclosure that I designed for it. As a 3D CAD tool to design the enclosure I choose Solvespace. Solvespace is free and open source available for Windows, OSX and Linux. I use Solvespace a lot and it has it's limitations but I felt it was fully capable for this job and indeed it didn't disappoint. Before starting I made a couple of simple drawings with pen and paper, I measured the size of the harddisk and the Raspberry Pi. I also used a template for the Raspberry Pi mounting holes that I found online. With all this information I started drawing with Solvespace. The power of Solvespace (and other 3D CAD programs) is that's it's very easy to make changes to the 3D design. While working on the design I noticed that USB harddisk can become hot so I figured it needed to be cooled. In the drawing I elevated the harddisk a bit by adding four supports one on each corner of the disk and made four ventilation slots in the bottom of the enclosure thus allowed air to flow freely around the harddisk. The Solvespace files of this enclosure are here. Make sure to adjust the size to the USB HDD you're using. The 3D design I came up. The printed parts, bottom and lid, are grey, the green part is the Raspberry Pi and the red part is the USB harddrive. I printed all the parts on my Hephestos 2 printer using black PLA filament and the result looks pretty good. Assembly of the parts is simple. First I used 2.5mm bolts and nuts to mount the Raspberry Pi upside down to the lid of the enclosure. Next I insert the USB HDD into the bottom placing it on the elevated supports. The enclosure is fastened with four bolts 5x60mm and 5mm nuts. The nuts fall nicely into the hexagonal cavity of the feet. Finally the USB cable of the HDD is connected with the Raspberry PI and the ethernet cable is connected from my router to the Pi. 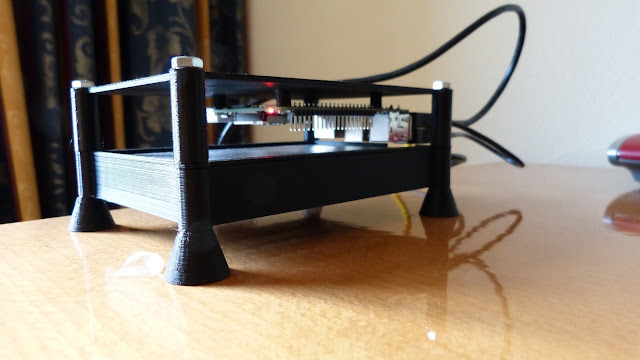 The server has run for several weeks in the 3d printed enclosure without any problem. For those that want more information I made a YouTube video about this project.